Which Constitution are you? Which of the Five Elements is the most resonant in your mind, body and soul, driving your strengths and your weaknesses? This is your chance to find out! There are 25 questions and it usually takes less than 10 minutes. The more honest you are, the more meaningful your result will be. Rest assured that we will not save your answers to individual questions, we take your privacy seriously. Enjoy. Your results will be on the next page. 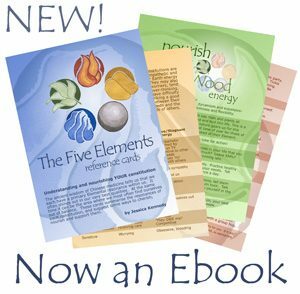 It’s taken a while, but the Five Elements Reference Cards are finally available as an Ebook. I’m amazed to discover it’s more than a decade since I first created the cards. Sets of these twelve cards, densely packed with ancient wisdom, have found homes with people all over the world. They are with acupuncturists, acupuncture patients, shiatsu students, Feng Shui practitioners, and those who just want to explore their own Five Elements, everywhere from Saudi Arabia to New Zealand. In my mind’s eye, individual cards are propped up on shelves or stuck to bathroom mirrors, giving daily inspiration in nourishing a particular Element. This Ebook edition includes all the text of the cards, plus a few extra words here in this introduction, and at the end. Images of each card are included too, and hopefully are big enough for you to read, but also small enough not to take up too much space on your device. Now I will also be able to imagine you communing with these Five Element Cards on your Kindle – on the beach in Thailand, or up a mountain in Wales. Wonderful. People often ask me how to find a good acupuncturist in their area. And my answer is, ask around. Find a good recommendation from someone you trust, which describes a practitioner who you think will be a good fit for you. Have a look at their website and give them a call. Find someone who feels right to you. Does the style of acupuncture matter? And the question which often follows, is which kind of acupuncturist you should visit. Does the style of acupuncture matter? And one answer is is definitely no – I’ve had wonderful experiences myself as a patient with acupuncturists from a number of different traditions. My experience is that finding a great practitioner is more important than the style they are practising. But, like every practitioner, I have a fondness for the style that I use myself. ‘TCM’ (see below) is the dominant style of acupuncture in the West, so that is not hard to find. And, when I choose a practitioner for myself, I try to find one whose practise includes Five Element Constitutional Acupuncture. Why? Because constitutional treatment makes me feel great. And because of the times, as a practitioner, that I’ve re-evaluated someone’s constitution after a few treatments and suddenly seen them blossom across the board. Beautiful. I trained at the wonderful College of Integrated Chinese Medicine to use both TCM and Five Element Constitutional Acupuncture, in an integrated way. By choice, as a patient, I’d also choose someone who has both of these amazing systems at their fingertips. Each of these are subsets of the full wisdom and heritage of traditional East Asian medicine, which is an extremely rich and diverse body of knowledge. Historically in China, Korea, Japan, Vietnam and beyond, a multitude of doctors practised a wide range of traditional oriental medicine. These caches of invaluable medical knowledge were usually closely guarded, and often passed down through the generations of a family of doctors. The thing now known as TCM, which stands for Traditional Chinese Medicine, is a codification of a part of these traditions, put together under Chairman Mao in the 1950s. It’s a fantastic, practical approach to medicine, and to getting you back on your feet when you’re under par. But, it’s not the case that TCM is ‘everything there is to know about traditional East Asian medicine’ or even that it’s ‘everything there is to know about traditional Chinese medicine’. 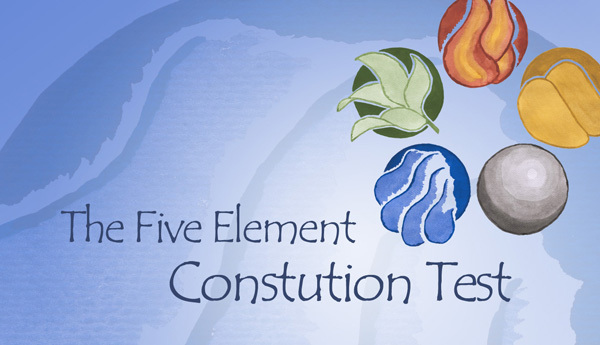 Five Element Constitutional Acupuncture is the legacy of other strands within the traditions, carried down through lineages of practitioners, and first taught in the West by an acupuncturist called JR Worsley. Five Element Acupuncture looks at you more at your core. In the terrain of your wellbeing, what is coming from circumstances, and what is coming from who you are and how you were born? Approaching you on this level can be very powerful. Do they really practise Five Elements? One source of confusion is that if you ask a TCM practitioner whether they practice Five Elements, they may say, of course they do. And it will be true. 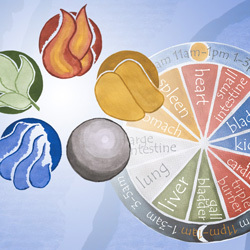 To the extent that the Five Elements framework is a lens for looking at the body and health and medicine, then of course a TCM practitioner is considering and treating the health of your Wood organs (liver and gall bladder) as well as your Water organs (kidneys and bladder), and so on. The word which is more distinctive of the style of acupuncture I’m talking about here is ‘constitutional’. Do they practice Five Element Constitutional Acupuncture? Are they working to diagnose and treat your primary constitutional resonance. In the jargon, are they looking for, and working on, your CF or Constitutional Factor. But the main thing, is to find a great practitioner for you. I feel much more concerned for all the people who never get the chance to see, or never think to explore, the amazing things that traditional East Asian medicine may be able to do for them. They are the ones who are really missing something special. For inspiration on how to nourish all of your Elements, do buy my lovely reference cards, and subscribe to my newsletter. If reading these cards leads you to think that your Liver may be Stagnant, your Heart Qi may be Deficient, or your Kidneys may be out of balance, this doesn’t mean there is cause for alarm. Certainly you should take any medically significant symptoms to your doctor to get them checked out. But, Chinese Medicine is also interested in more subtle signs of imbalance. Symptoms that your doctor would call ‘sub clinical’, from a conventional medical point of view. And Chinese medicine is talking about your physical Liver or your physical Spleen. But, with each organ and each Element, it’s also talking about a wider matrix of resonances that tend to move together. 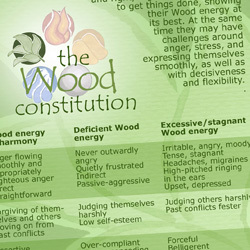 When it talks about your Wood Energy, it’s talking about your Liver in the same breath that it’s talking about your tendons and your anger and your fingernails. When it talks about your Metal Energy, it’s talking about your Lungs but also your skin and your immune system and your grief. Chinese Medicine doesn’t just want you to be ‘not sick’, it wants you to be in glorious, abundant, wholehearted balance. Fantastically well. And so, in the modern world of speed and pressure and stress, almost no-one is in perfect balance. I don’t think I’ve yet met someone who could tick every ‘in balance’ box. So rest assured, you are in good company. If your acupuncturist is practising Five Element Acupuncture, they will be keen to diagnose your Constitutional Element. This Constitutional Factor, often abbreviated to ‘CF’, gives insight into who you are at your core. No matter that your Spleen and Earth have been knocked off balance by your diet, or your Lungs and Metal are reeling from an attack by an External Pathogen, underlying all that, your Constitutional Factor is more fundamental. It’s likely to imbue you with your greatest strengths, and the things people love most about you, as well as your notable weaknesses and tendencies to imbalance. You Constitutional Element is likely to be the one, in the list above, where you sit least frequently in the ‘In Balance’ column, and most often find yourself at one or other end of the spectrum. So then it may be tempting, and it may even be accurate on occasion, to self-diagnose. Ah yes, you may think as you read one of the Elements, that definitely sounds like me. And I did this myself as an acupuncture student, and bamboozled the acupuncturist I was seeing as a patient, into treating me as an Earth Constitution, for a year or so. Before we realised that, while I had imbalances there, that wasn’t the answer. We switched to another Element, and much more profound change took place, across all my Elements, which is one of the hallmarks of successful constitutional treatment. We are not always in hurry to see ourselves completely clearly. With some people, their Constitutional Element is obvious the moment they walk through the door. But, it’s not always that straightforward. It can become a process, even for a skilled practitioner, to figure out your Element. Sometimes after a few treatments it becomes clear that together you’re engaged in asking your body a series of questions, and listening to the answers. Perhaps a significant imbalance in one Element starts to clear as a result of your first few treatments, and it becomes clearer what is more central and what is more transient. What are the tools your acupuncturist uses to diagnose you constitutionally? They’ll be listening to you closely, and not only to what you say, but to what you don’t say, and how you say it all, and they’ll be observing you closely. The four pillars of Five Element diagnosis are your colour, sound, odour and emotion. Each Element can generate specific colours across parts of your face (no matter what your ethnicity). Are your cheeks ashen or florid? Is the darkness under your eyes more blue or more greenish-brown? Does your flesh have a yellowish tint throughout? And I’m afraid, yes, your acupuncturist may be smelling you. You yourself, that is, not your toiletries. As you walk into the room, or after you take off some clothing, or as you lie on the couch. You may have noticed yourself that family members may have a distinctive smell. Babies of course are famous for smelling gorgeous, but some adults smell wonderful too. And if your natural odour is not great, Chinese medicine sees that very much as a sign of imbalance. The categories for this don’t all sound very pretty – rancid, scorched, fragrant, putrid and rotten – but each has a healthy and a less healthy manifestation. An unhealthy ‘fragrant’ smell, for example, can be unpleasantly sickly. A healthy ‘rancid’ smell, is like the wonderful smell of freshly cut grass. How smoothly does your anger flow? Is your grief stuck? How readily can you truly take in sympathy or reassurance? When you recount a life experience that had a big impact, what emotion has stuck with you the most – the grief or the fear? The resentment or the pain of feeling unloved? Together these signs are pointers, to what lies more under the surface, of your body, mind and spirit. And the proof of the pudding is successful response to treatment. Asking your body the question, and listening to the answer. Confirmation of your constitutional diagnosis comes through seeing your beautiful response when the right Element is addresssed. It can be an amazing pleasure to behold. Like your bodily organs, these Elements are not just five lumps of stuff, they are something much more sublime and alive than that. They are a way of viewing the exquisite magic of nature and all its workings. Like your Yin and Yang, your Five Elements exist in harmony, and in dynamic relationships with each other, and not in isolation. Reflecting this, they are sometimes translated as Five Phases rather than Five Elements. In fact, I just looked it up, and even I didn’t know how many other ways they are known: “The Wu Xing (Chinese: 五行; pinyin: Wǔ Xíng), also known as the Five Elements, Five Phases, the Five Agents, the Five Movements, Five Processes, the Five Steps/Stages and the Five Planets of significant gravity” (Wikipedia). The Five Elements model is a rich framework for viewing yourself, the world, and everything in it, and seeing how all of those things are in an ongoing relationship with each other. Water nourishes the plant life of Wood Nothing in nature stands still, and soon winter is revitalised by the first buds of spring. Wood burns to create Fire Spring gives way to summer. The ashes of Fire create Earth The bright sunshine of Summer builds up to the fields of abundance in late summer. Earth is compressed to create Metal Summer yields to the mellowness of autumn. Metal cups aquifers to create springs of Water (Like the picture on the Evian bottle.) Autumn retreats as we embrace the stillness of winter. From this cycle, arise ideas such as ‘where the child is crying, it may be the mother that is sick’. A prosaic example would be that where your digestive Earth energy is not strong, phlegm can start to bog down your Lungs and respiratory system, clogging up your Metal energy. Wood controls Earth Plants and trees cover Earth. Fire controls Metal Excess Metal is melted away by Fire. Earth controls Water A dam holds back the deluge. Metal controls Wood The axe trims the tree to size. Water controls Fire A bucket of water subdues a blaze. And where this cycle goes wrong, the Element that is flaring up can be a pointer back towards your Element that should be controlling it. For example digestive problems in the realm of your Earth’s stomach and spleen, which are worse with stress, suggest that Wood and your Liver are also involved. As in many areas of Chinese wisdom, you are a microcosm of the whole. To continue your journey of Five Element exploration, buy my lovely reference cards, and subscribe to my newsletter. I received some lovely feedback from an acupuncture student that her class and their teacher, reading these cards, debated whether excess joy really belongs under Excess Fire. I am honoured to be playing a supporting role in the education of new cohorts of acupuncturists! So, when I classify excess joy and over excitement as reflections of excess Fire Energy, at the same time as I classify excess anger as a reflection of Excess Wood, I don’t mean to suggest that we should routinely work to sedate those energies as soon as we see those signs. When a skilled acupuncture practitioner undertakes a full Traditional Diagnosis, a core challenge is to map out that patient’s individual and interrelated patterns, in a web of cause and effect, before deciding where best to treat. Where Fire is Blazing, or Liver Yang is Rising, it’s often clear that the root of their flaring ‘excess’ is a deeper deficiency, and Tonifying their Fire Qi or Nourishing their Liver Blood is what is needed, to support and settle that Element. In a similar vein, it would be a rare patient who would need their Water energy draining. Manifestations of excess again may be symptoms arising from underlying deficiency. Or perhaps just a happy abundance of youthful vitality, which could benefit from a little harmonising and balancing. And happily, successfully Tonifying with acupuncture alone, is one of the beautiful strengths of Five Element Acupuncture. Ready to plunge further into the Five Elements? Do buy my lovely reference cards, and subscribe to my newsletter.